Brett Middleton is the paid media manager at Leadpages where he is responsible for the advertising strategies for paid media. He reviews each strategy and contributes his ideas behind them. Brett: If you can get your audience to ask themselves the question that you have in your ad and the answer is yes, that is who I am. They are very likely to click on your ad and engage with you further. If they say no if that question doesn’t fit who they are, you’re not wasting their time. They’re just going to go on with their day. That’s perfectly fine. Tim: This is the conversion journey in 13 parts as told by the Leadpages team. In this all new series you’ll hear what we do each day at Leadpages to find, convert, and keep our customers. I’m Tim Paige, and this is the all new ConversionCast. So we’ve been in this in the last episode we started talking about actually driving traffic to the content that you’re creating and we have Joshua Lauer talking about how to rank in the search engines, how to get traffic that way. But this episode I wanted to talk more about how you can really get out there and just start driving traffic right away and play both the long game and the short game because I know that in this conversion journey we’re doing a lot of things to focus on what’s going to work for a long time but there’s also definitely a need to say well we want to drive leads now. We want to drive conversions now and that’s where a lot of Facebook ads come in and a lot of our Facebook marketing. So that’s why I wanted to bring you in Brett. So first of can you tell everybody kind of what your role is here at Leadpages? Brett: Yeah. I’m the paid media manager here at Leadpages so I’m in charge of all the strategy for any advertising that we do, any paid media that goes out. It doesn’t matter what channel it is. I have to at least look at it and come up with the ideas behind it. Tim: Got you. And this is just to give people a sense of it. We’re not spending a few hundred dollars a month on our paid media. It’s a huge investment for us. Is that right? Brett: Yes. Almost a staggering amount. It’s a growth channel for us. Tim: The reason I bring that I up is not to brag or anything like that but I think it’s important to understand that what we’re sharing is coming from a place of a lot of data and a lot of information that we’ve gotten that’s informed the decisions that we’ve made in our marketing and in the way that we drive traffic and focus on results. I think it’s easy enough to say we’ll like oh somebody had this amazing month where they spent whatever amount of dollars and they got this huge return. But we’re doing this on a massive scale and getting a lot of data in return. I think that’s important to point out. So the way I wanted to kind of frame this and to start is with a little bit of a case study and that is something that we’ve taken a little break from at the moment. But it’s been one of the bigger growth channels for us and specifically the way that we have driven Facebook ad traffic to the these courses that we create. Can you talk a little bit about that and how it’s been structured? Brett: Absolutely. One of the problems when you’re using paid media to grow your business is just the simple, the cost that is required to bring someone to your website. When you’re in good ad words or other channel, you can see cost per clicks. Depending on the space that you’re in, a dollar, $2, $3. Some of the clicks that we’re going after like the $5 to $10 range. So you need these lower cost acquisition channels and using Facebook to promote educational content like a course, a webinar, even just boosting a blog content that you’re putting on Facebook can be one of the most impactful things that you can do to generate leads like at a low cost basis. One of the things that we were doing we had a Facebook ads course that we were promoting out to an audience. We were trying to promote it to people who show interest in Facebook advertising maybe they’re small business owners. And we were generating leads at about $5 per lead which is just unreal for us. Tim: Yean and just to be really clear about this. it’s kind of similar to what Bob Jenkins talked about on the first episode of all new ConversionCast is he was creating centerpiece content. It’s like that focal point of content that we can use to promote and we were using content upgrades. But the Facebook ads course you’re talking about was one of a few different courses that we had where it’s a lot of content. I mean the Facebook ads course was like 4 hours of video. It was checklist. It was worksheets. It was all these stuff and it was all on landing page we call it the value bomb reverse squeeze page. And you’d put all these content on the page and people could watch all the content and do whatever they want on the page. But if they wanted to download all that because there’s no way they’re sitting on that page for 4 hours watching all those videos then they would opt in to get all that content. And so we were then driving traffic directly to that course page. Is that what you’re talking about? Tim: Okay. And so what’s the strategy look like when you’re saying, okay let’s say since we already talked about an episode on how to create that content. What’s the strategy look like when you say okay I’ve got the content, now how do I drive traffic to it from Facebook ads? Brett: Good question. So let’s say when you’re going with a course, you treat it almost like any other page that you would be sending add traffic to. You’re trying to find the best possible audience that’s going to be engaged with this, this content that you’re promoting. So in the Facebook ads examples we were finding Facebook advertisers and small business owners and digital marketers and promoting the course out to them and in terms of the actual like the tactics that are involved, I say kind of the best thing that I could tell you is make sure that you have you custom conversions completely set up through your Facebook pixel. So you’re tracking the right actions that you want people to take and you’re able to create campaigns that are designed for website conversions and not just for page views or clicks. Tim: Before you go on, can you tell us what the– Maybe you’re going to do this anyway but can you tell us what the custom conversions were for this example like what were you focusing on getting data for? Brett: Well we would just call it the custom conversion a lead there because we’re collecting an opt in. Tim: Okay. So it was just the simple one thing that you were focusing on? Brett: Yeah. And the Facebook pixel can be kind of confusing because you have your base pixel code that goes on every page that attracts page views. You just swap out the page view portion of that and put in just a snippet that is for leads. You could find it just in your pixel section in Facebook advertising. It’s one of the things that a lot of people overlook to get your conversions actually set up because a lot of people are just going to get into creating ads. They’re collecting page views and they know that traffic is to get them to their site and they look forward in analytics. But to actually set up your conversions and be able to see what conversions are happening from specific ads in Facebook is really important. Tim: Got you. And so you would put that pixel in the thank you page? Tim: Okay. Got you. So you set up your conversion goals, you’re good to go there. What’s next? Brett: So once you got a conversion set up, we built a website conversion campaign. The default there is going to be CPM for your bidding. It’s one of the most important things I can tell you. If you’re using a website conversion campaign, the default is going to be CPM. If you use a different type of campaign, you should try to use CPM bidding if at all possible because this is the way that you get really cost effective clicks because you’re not paying Facebook for every click that comes through, you’re paying on a per thousand impression basis. So if you have a really highly engaging piece of content, you’re not paying 50 cents, a dollar for every click. I might be paying $5 for every thousand impressions but I have a really good click rate so I’m going to pay 15 cents a click which is some of that we were seeing like in that 15 to 25 cent per click range. Tim: Awesome. Now before we go any further I have to mention that all throughout this episode and in the all new season of ConversionCast. You’re hearing what we do at Leadpages to automatically grow our email list and boost our sales every single day. Well in my next webinar I’ll show you exactly how to do this for your business. In this free training I’ll give you a live step by step walkthrough of the top 3 tactics we use at Leadpages to automatically grow our own list week after week. This is going to be everything you need to know to implement this in your business. So make sure you check it out. To reserve your spot on the webinar, text LEADPAGESLIVE to 33444. That’s all one word, LEADPAGESLIVE to 33444 or head to LeadpagesWebinar.com. All right let’s get back to it. Nice, okay so you focus on that. And then how do you determine the audience that you want to market to? Because I know you mentioned that it was to people interested in Facebook ads and marketers and that kind of thing. But was that just based on the information that we already had from our existing customers. Was it a hunch? Was it something that you tested to find the right audience? Brett: A lot of times when you have a piece of content like a Facebook ads course or let’s say that you are a physical trainer and you have a piece of content that’s about weight loss. Intuitively you’re going to go out and try and find those people who have shown a recent interest in content and Facebook pages that are about weight loss and fitness and dieting. Facebook collects all these interest data based on who people what page [0:09:52] [Indiscernible] go out and like, what websites they visit. Things like that where you have all this really good interest data. So yeah it’s not always just about looking at your historical data because this is something that I would recommend for anyone who hasn’t done any advertising yet. You put out a piece of content. You build an audience that you know like their interest just mesh with what you’re doing. And Facebook has all these data. Tim: All right so you get the audience. You got that ready to go and how do you when you’re going to create the actual ad. If you’re sending it to something like a course or some kind of a long form piece of content, how do you make sure that that ad is going to resonate with the audience and get them to click through? Because like you mentioned you’ve had a lot of success with this ad, $5 a lead is pretty incredible. So what is it that’s working about that ad? 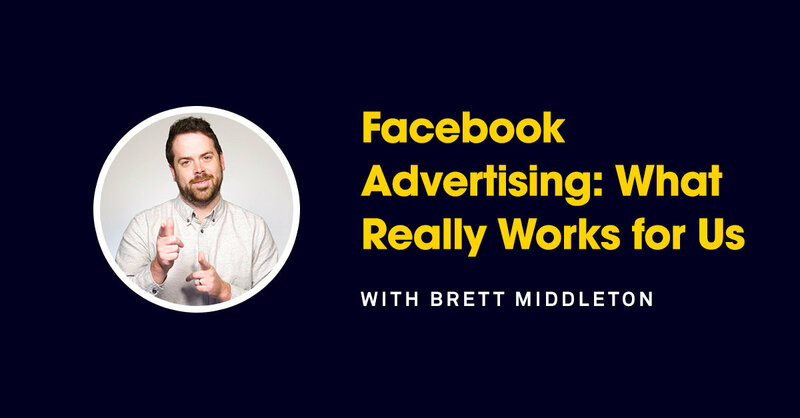 Brett: When you’re in Facebook, look for some ads and see what’s like what you see first, see what stands out to you. A lot of times people look at the image or the video that’s in an ad and the next thing they do is they look at the headline and then they might if that is engaging and interesting to them they’ll go back and read it from top to bottom. So just having a really captivating image, a lot of people will have like that kind of like a stack image kind of photo. They’re shown probably the type of person that they think will find this ad interesting or maybe if it’s a course you got [0:11:20] [Indiscernible] the image that tells you the name of the course that you’re offering. You need an image that is going to be informative, engaging and you headline that very clearly states what people are about to get if they interact with this ad. And then follow that up with trust factors. You’re telling them what they’re going to get out of this course and list things some specific things, some bullet points that they’re going to get. Try to make it as informative as possible. Like that description copy because you caught their attention with your image and headline and then you could start to actually sell them on why they should click through on the rest of the copy. Just do that research to see like just confirm that that’s the way that you look at an ad and build your ads that way. Be really interesting in a headline of that image. Tim: Can you share an example of what one of ours look like. I don’t know if you have it right in front of you. But if you can give an example like what would the image look like? What would it say on the image? What would a headline be? Just to give a sense because I think all the stuff that you said is great but I want to give people a real clear example. Obviously you can find our Facebook ads out there but I’d rather have them to get this to really hear an exact example of what an ad might look like and say. Brett: Got it. Well first of I highly recommend that you look for our Facebook ads and click on them. The example that we’ve used for the Facebook ads course since that’s what we’re talking about. We’re trying to help people learn how to use Facebook advertising better so we took pictures of the Facebook advertising interface. We pulled up the Facebook ads app, the ad manager app on a phone and had someone looking at it, took a picture of it. Things like that. You want to show someone any action of doing something. Your image should be action focused about all possible and it should portray the action that you want your users to take. Tim: So you might have a headline for example that’s like something is clear as get your free Facebook advertising course or something that might say for example frustrated with Facebook advertising or want to try and figure out Facebook advertising something along those lines as well? Brett: l think it’s always really interesting to test out using a question in the headline just to try and get someone to ask themselves that question. What I like about that is if you heard Clay Collins do a podcast or Converted. He talks about trying to make your audience make a decision. Because 100% people who don’t make a decision aren’t going to become a customer of yours. So if you can get your audience to ask themselves the question that you have in your ad and the answer is yes. That fits who I am. They’re very likely to go ahead and just click through on your ad and engage with you further. If they say no if that question doesn’t fit who they are then you’re not wasting their time. They’re just going to go with their day. You’re not going to get a click on your ad and that’s perfectly fine. Tim: and I think that’s interesting too because I think one big mistake that a lot of people make is they focus every step on the end goal but really each step has its own mini goal that leads to that end goal, right? So the goal of the image is to capture their attention for a moment. The goal of the headline is to create interest. Maybe the goal of the bullets or whatever below it are trying to get them sold on clicking. It’s not to get them sold on buying your thing, not to get them sold on anything else but to get them sold on clicking. Once they click, it’s to get them to opt in. once they opt– so each thing has its own step and I think it’s important to remember that as your creating ads. So what’s one thing that is you would say is hypercritical every time we’re going to create a new ad, the most important thing that you focus on as you’re going to do that? Brett: Whenever I’m trying to build a new campaign it’s something that I haven’t done before. This is something I run into more when I was just advertising for myself. I previously worked with small businesses at an agency. When you’re dealing with an audience that you’ve never advertised to before, you don’t always know what to expect. So it’s budgeting properly and just testing things. You need to go into every new ad campaign with a specific goal with an idea of the correct audience and you should always be testing. I typically like to test. This is something I’ve never worked with before. I like to test a couple of different audiences and I give them each their own ad sets like the results to see how not only how the audience are interacting with me and how they’re engaging with the ad content but then to test your different messages within each ad set to just kind of like start to piece things together and match okay audience A really likes ad B so that’s what I’m going to do in the future but audience B prefer ad C.
Tim: Brett Middleton, paid media manager at Leadpages, thank you so much for sharing with us. We really appreciate it. Brett: No problem. Thank you.